Lucca, one of the most romantic towns in Tuscany, holds many attractions for tourists. Its historic center, with medieval towers and nearly 100 churches, is completely enclosed by its walls, which make it a good city for walking, biking, and shopping. Find a beautiful place to stay and explore all that Lucca, Italy, has to offer. The walls enclosing Lucca's historic center are some of the best-preserved ramparts in Italy. You can walk clear around Lucca on top of the wall. In the 1800s, the top of the thick wall was planted with trees and grass turning it into a huge park and a pleasant place to walk or ride a bike. There are more than four kilometers of walls with six gates and 11 bastions. San Michele Church is in the large square that was originally the Roman Forum in the center of Lucca. Today, it's still a lively square lined with medieval buildings housing cafes, shops, and homes. 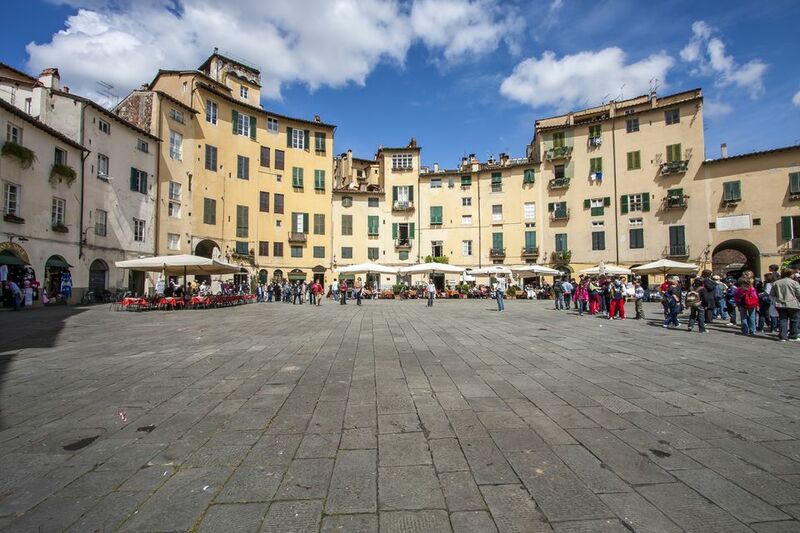 The square is a favorite place in Lucca to sit and have a coffee. The beautiful marble church, built from the 11th through 14th centuries, has a large Romanesque facade—larger, in fact, than the actual church. It's topped with a statue of the archangel San Michele, or Saint Michael. Lucca's cathedral, dedicated to San Martino or Saint Martin, sits on Piazza San Martino surrounded by impressive medieval buildings. Originally built in the 12th to 13th centuries, it's Romanesque in style and has an intricately decorated marble facade. Next to the cathedral is its tall 13th-century bell tower and Casa dell'Opera del Duomo, a typical medieval house of Lucca. The interior is Gothic and holds many artworks, including the Volto Santo and the 15th-century tomb Ilaria del Carretto, a masterpiece by Jacopo della Quercia. San Giovanni Church was built in the 12th century and partially remodeled in the 17th, but still has some Romanesque features. Inside the church, you can go underground for a fascinating look at archaeological excavations dating from the first century BC through the 11th century AD including Roman remains, part of an early Christian church, and a medieval crypt. It's open daily from mid-March through November 2, and on weekends and holidays the rest of the year. Each evening at 7 p.m. the church holds a music performance. Piazza dell' Anfiteatro, an oval shaped piazza, was the site of a Roman amphitheater. Parts of the original oval ground-plan and outer ring of second-century construction can still be seen. Buildings and houses were built around the arena during the middle ages. The lively piazza is ringed with shops, cafes, and restaurants both inside and out. In July, it's the venue for open-air music performances. Climb the 130 stairs to the top of Guinigi Tower, one of Lucca's 14th-century towers, for fantastic views of Lucca. Guinigi Tower is on Via Guinigi, a well-preserved medieval street where you'll also find the Case dei Guinigi, a complex of 14th-century towers and brick houses. The Guinigi Tower can be identified from a distance by the large oak tree growing out of its top. Lucca is a good city for shopping. There are many enticing shops for delicious foods, jewelry, and fashion, and several artisan workshops to visit in the historic center. Via Fillungo is a main shopping street in the historic center. Here you'll find all kinds of stores, from food and wine to clothing and household items. The street is mainly pedestrian and almost always full of people walking and browsing the wares. Also on Via Fillungo is the Torre delle Ore, or clock tower—another medieval tower that you can climb. In a 15th-century villa near the east walls, the Villa Guinigi's museum has local artifacts and artworks from prehistoric times through the 17th century. There's a large collection of local Romanesque, Gothic, and Renaissance art including 15th-century wood inlays. Combination tickets are available for Villa Guinigi and the National Museum in Palazzo Mansi, near the west walls. Palazzo Mansi has paintings as well as the tapestries and frescoes of the 16th- through 19th-century palazzo itself. Palazzo Pfanner, with a costume collection and lovely gardens, is another palazzo that can be visited. Lucca's botanic garden has a small lake with water plants, a collection of mountain plants, succulent display, greenhouses, and medicinal plants and herbs. It's a peaceful place to get away from the crowds. In summer, there are evening concerts scheduled, too. San Frediano's facade is decorated with a stunning 13th-century Byzantine-style mosaic. Made mostly with gold leaf mosaic that glows beautifully in the sunlight, there's also a little color to make the apostles and Christ stand out. The church was originally built in the 6th century but remodeled in the 12th. Inside is a Romanesque baptismal font. There are also several artworks and frescoes and the mummified body of The Incorruptible Santa Zita. Puccini, the famous opera composer, was born in Lucca and his home is now a museum with his piano, musical scores, and more Puccini memorabilia. You'll see a bronze statue of Puccini in the piazza bearing his name, a pleasant square with a few cafes and a restaurant. Visiting the villas and gardens near Lucca is a good day trip that can be done either by bicycle or car.